I never played Novastorm. I’ve been familiar with some of it’s music for years though, via the French magazine game music CD I posted a while back. Having re-listened to it recently, I decided to finally seek the complete soundtrack for it, convinced from the quality that I would find a CD-DA redbook easily. Mistake ! Turns out the game’s audio is embedded into some complex compression system and that there’s no way to easily rip or even record it ! Player One Magazine must have received master tracks from Psygnosis themselves when they made that CD in 1994. Anyway, searching around on the web, you soon notice that this soundtrack left a strong impression on those who played it. Youtube gameplay videos are full of music requests and lamentations over the lack of an official soundtrack. Among these, I noticed a person called Bobske who was claiming he actually recorded the game audio and could send it to anyone wanting it. And he did ! This is his work I am sharing here. So that’s it ! This version is pretty much the best it can get, unless someone goes through the trouble of running the game on an old ’94 PC, or the master tracks are finally released by Psygnosis and Rik Ede, the composer. Anyway, great music. Techno-ish sci-fi atmospheres, both epic and hypnotic, quite typical of the old European game music scene. Level 4 Stage 1 remains one of my favourites. Really too bad they didn’t choose CD-DA support ! Thanks for hosting the soundtrack! Thank you so much for providing us with this awesome piece of soundtrack music, niki and Bobske! I’ve long searched for this and you made me very happy. Back then, I loved that game. I still have the CDRom, and stil works. So i did multiple sound extraction to replace bad tempo scratches with good part. Here is the Boss 1 music in 48khz FLAC without any scratches. Here is the Complete Level 1 UltraQuality edit, 48Khz, FLAC. ya know, in a way, the skips and stuttering gives it a more nostalgic feel. I remember playing this on a 486 box with a crappy semi-broken 4x cd-rom drive I salvaged from work, stuttering throughout the whole game every time the drive was re-seeking… Good work on the cleanup though. Looking forward to the entire album if you’re up to it. After more than 30 hours of work, here is the full Novastorm Soundtrack in very high quality. There is still some room for improvements, but it requires too much time, and i’m too exhausted right now. I’ll probably do some more cleaning later. Wonderful job ! I’ve long searched for this and you made me very happy. Many thanks for this ! I absolutely agree, the game was a lot easier in hard mode because of all the money you got from those bunch of ennemies. More over, starting with three lives, you end up with seven because of those points you get from extra enemies, rofl. I stopped here to thank Bobske again, 4 years ago you sent me the full set of tracks to my mail, still I’m so grateful to you, I’m a big fan of this game, I used to play it daily just to enjoy it is music! Thanks to Bobske for his hard work, thanks to niki for hosting it, and thanks to Dricks for cleaning. I hope Rik Ede will stop by someday to sell/give away this legendary soundtracks! There was a CD produced of the music. 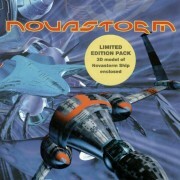 It was called “novastorm: the soundtrack” and I believe was used for promotional purposes. They have been available for sale on ebay UK. Thanks so much Dricks, you are the best, searched for this for years!!! Very thanks Drick! an excellent work!!!! Awesome! Been waiting for this… Quick question: When you were ripping the soundtrack, I assume you had to go in-game via dos-box while running an external recording program (creative recorder or something) kinda like what Bobske did right? Were you running the game via cd-rom or as a cd-image mounted with a program like daemontools? Maybe the skipping could be eliminated this way? Back to the time where is was playing it on a 486, there already was skips. The recording itself is very easy uing dosbox : press CTRL+F6 to activate it, and press CTRL+F6 to stop it. I’ve been looking for this track for awhile and only thought about the idea that the audio was part of the video files that ran in the background. You mentioned a weird encoding which makes sense — that was back at a time when the visual and audio quality of that game was cutting edge. Anyway, to the point, I’d like to work on possibly building a decoder for the video files that the game used. I don’t know if anybody’s already started on this work or not but I’m willing to give it a try. Thanks! Great job done actually. Not sure if it worths to create the decoder for the game files – it is unlikely that music has better quality than it is played. in my opinion the best music EVER in a computer-game.. Thanks a LOT for this music, I was looking for it for a very long time, I loved this game. Dricks, thanks for your work, its the base for my personal soundtrack. To bad there is no complete original soundtrack on CD without these environment sounds, like the 2 tracks on “La Compil’ Player One” (btw. this “go get’m boys” interrupts the music on a bad way for me) with sweet 44,1khz in stereo! Wow, marvelous work on this complex rip Dricks. Hi, I’d like to thank Dricks for your hard work at assembling the soundtrack. However, there seems to be a problem with downloading it. There’s either an error which I assume is saying the file isn’t there anymore, or there’s no download link. Can anyone help me? Perhaps someone could kindly re-upload the FLAC soundtrack? Thank you so much for your help. Thanks a lot for your help, niki! Does anyone have the FLAC soundtrack as well? Great because I did exactly this and it was very painful to remove all the glitches. Then I regretfully lost all my work. Now thankfully there you are another person who has done it. Super. Thank you SO MUCH for this, I played this game when I was like 10 yo and even then I couldn’t get enough of the music! Now I can finally put it on my mp3 player and enjoy it! MANY THANKS, you’re my hero(es)!! just wanted to say thank you to dricks for the extra effort on cleaning up those tracks! your work is greatly appreciated! Many thanks for hosting this. As with many of the posters above, this is one of my favorite video game soundtracks. I have the original CD and could never quite figure out how to extract the audio myself. Just been thinking of music i liked again which of course brought me back here, is there any chance you could rip amiga music also? im after hollywood poker pro, the music is class and bring back many memories, lol. Any chance of a rip?